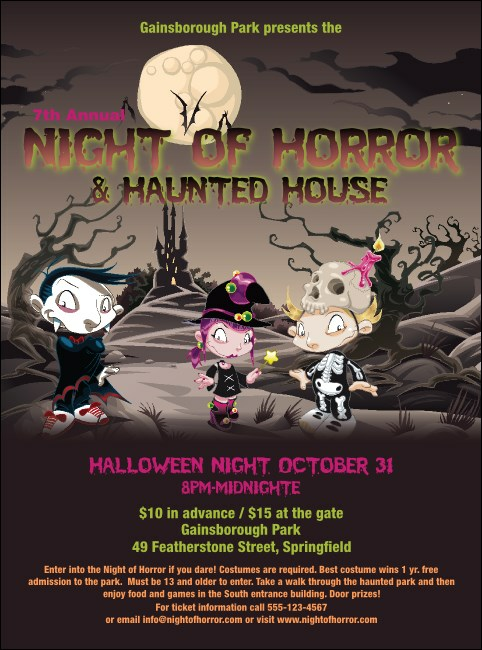 Little spirits tear up the night on this Costume Kids Flyer template, a wicked little number featuring an adorable trio of Halloween horrors. A tiny vampire, witch, and skeleton strut their stuff in front of a delightfully creepy background of twisted trees, imposing castles spires, bats in flight, and a full moon with a spooky font. Dress up your event with the right promotion from TicketPrinting.com.